Are you looking for a nice excursion in Hiroshima? There are wonderful events on Miyajima Island now!! The Miyajima Hina Doll Festival is held from the 25th of March until the 3rd of April. The 3rd of March is the actual day of the Dolls' Festival in Japan. This festival is a traditional event held to pray for girls' healthy growth. Families with girls display a set of hina dolls at home. It is believed hina dolls protect girls from bad luck. 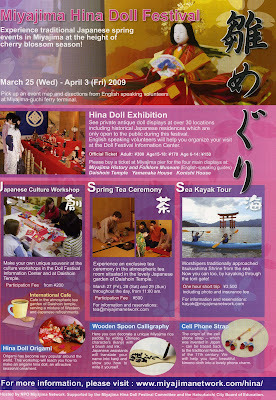 In this Miyajima Hina Doll Festival, you can see private antique doll displays at over 30 locations including historical Japanese residences which are only open to the public during this festival, and English-speaking volunteers will help you organize your visit at the Doll Festival Information Center in Omotesando Shopping Arcade. Please buy tickets at Miyajima Pier for the four main displays at: Miyajima History and Folklore Museum (English speaking guides), Daishoin Temple, Yamanaka House, and Konishi House. To find out more information, please check the official website. Experience traditional Japanese spring events in Miyajima at the height of cherry blossom season! !